Are you looking for an amazing fish recipe? If yes, then you need to try our pan seared swordfish with olives and capers! The whole dish can be made in under 30 minutes. That’s what’s great about making most Italian fish dishes! This is an adaptation of a Sicilian recipe I’ve had in many New York Italian restaurants. 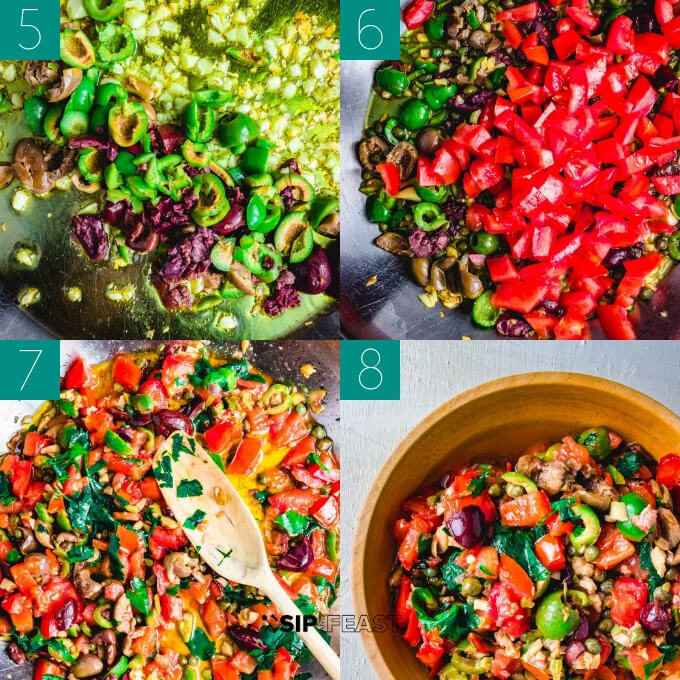 Some variations on the sauce in this recipe include the addition of pine nuts, raisins, and anchovies. I think the simple fresh flavors in our recipe go really well with the pan seared swordfish, but feel free to add any Italian ingredients you like. Great quality ingredients is where it all starts for this Sicilian style swordfish. Find out what’s real fresh from your fishmonger. Swordfish is obviously the first choice, but this recipe works equally well with Tuna. It’s always nice to have a plan B when going shopping! This Italian swordfish recipe calls for 1.5 pounds of swordfish, but the amount of fish really doesn’t matter. Feel free to double or triple the olive and caper sauce if making more fish. It’s really that easy! 2 plum tomatoes are needed – Feel free to use any type if plum tomatoes are unavailable or look bad. 2 Tablespoons of capers – I always have capers on hand, they add so much flavor to a variety of dishes. The Trader Joe’s variety is a great value. Final ingredient is 3/4 cup of mixed olives. Buy the high quality ones from the olive bar. Oil cured olives are so good in this! Avoid the stuffed olives and make it easier for yourself by buying pitted olives. As you can see in the pic below I forgot to do that. 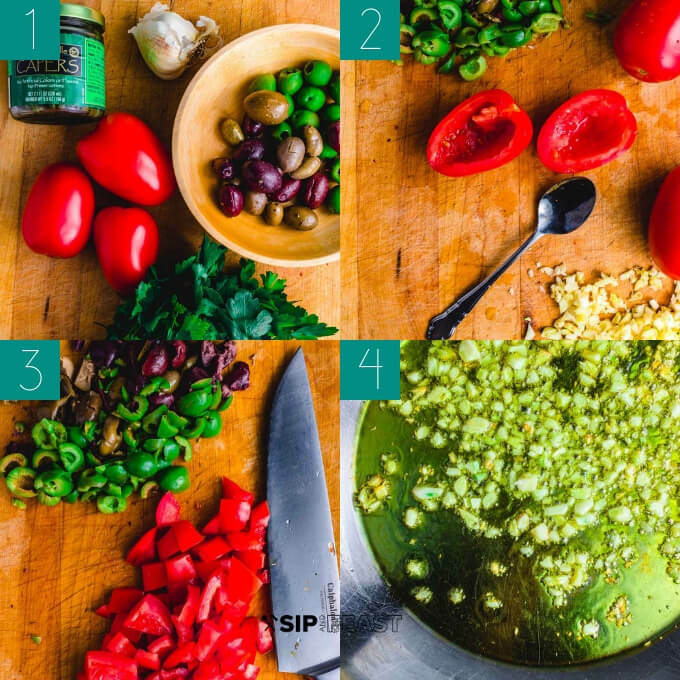 Image of the garlic, parsley, tomatoes, capers and olives. Rough chop the olives. Mince the garlic. Halve the tomatoes and scoop out the seeds with a spoon. Chop the tomatoes as shown. Saute the garlic for 1-2 minutes on medium to medium-low in 1/4 cup of extra virgin olive oil. Add the olives and saute for 1 minute. Add the tomatoes and saute for 1 minute more. Turn off the heat and add the capers, parsley, and pepper flakes if using them. Plate the sauce in a bowl and wipe the pan with some paper towels. The pan will be used for the next step of pan searing the swordfish. 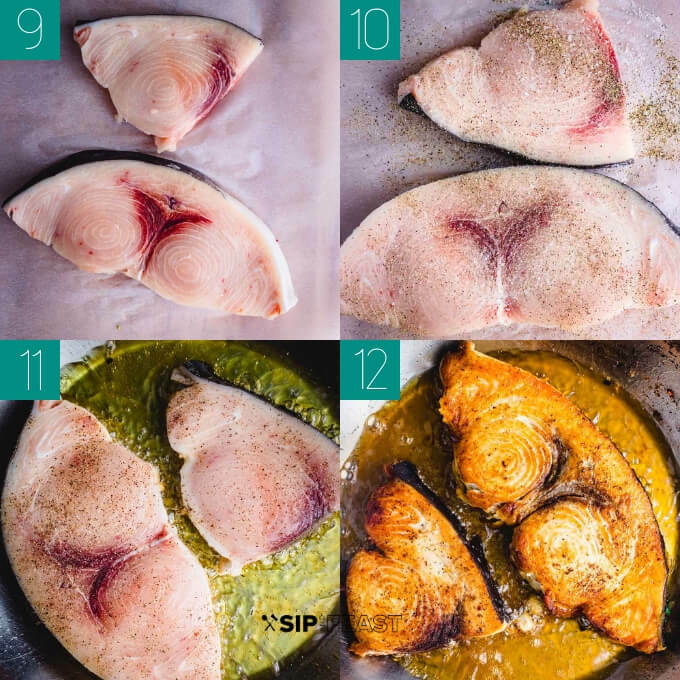 Pat the swordfish steaks dry with a paper towel. Season the steaks with the salt and pepper – about 1/4 tsp each of salt and pepper. Heat 1/4 cup of regular olive oil in the pan on medium heat. 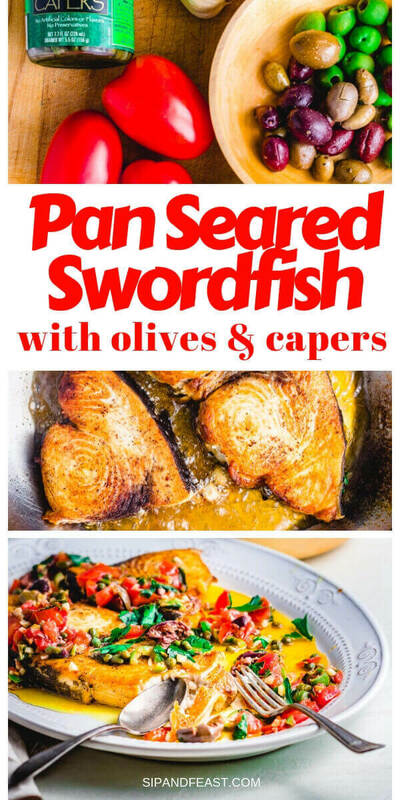 Place the swordfish in the pan and move around in the beginning to assure the fish wont stick. Basically let the oil get under the fish. After 3 minutes flip the swordfish carefully and cook for 2-3 minutes more until done. They should feel firm to the touch. Remove the swordfish and plate. 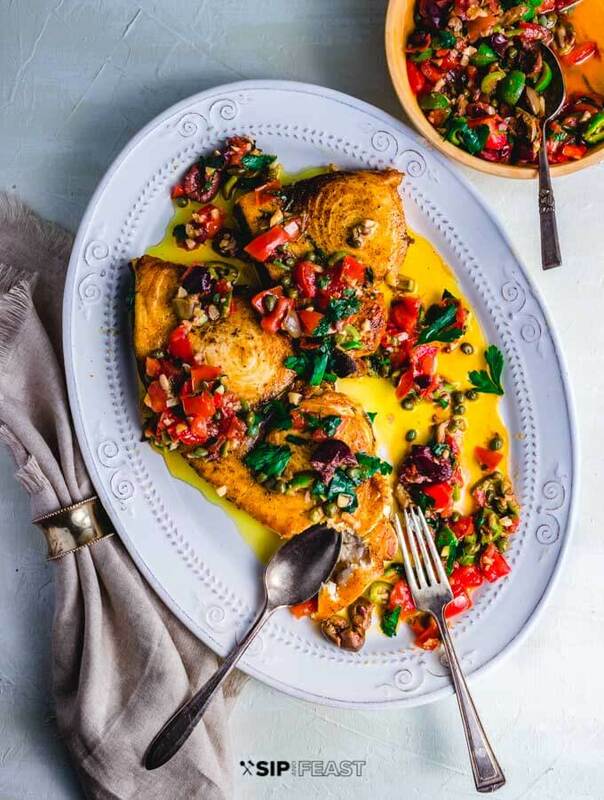 Serve the olive and caper Sicilian sauce all over the fish. My top swordfish substitutes are Tuna, Mako Shark, and Salmon in that order. Swordfish is a very meaty fish. It has an almost steak like quality and is very satisfying. It works well in many ways that other fish simply cannot . Kebabs are a prime example of one of those ways. Mako shark and Tuna have a similar texture to Swordfish. Salmon is not as robust and firm so that would be my last choice of the bunch. Can Swordfish Be Eaten Raw/Rare? While it can be, I don’t recommend it. You know why? I rarely see it in Japanese Restaurants. I think that is a major tell. Read this Quora info on Why is shark or swordfish not used for sushi? Now I do like to cook the swordfish a tiny bit under-cooked. Basically medium-well. If an oily fish like swordfish or tuna is cooked well done it will release more oils and take on a more fishy taste. What Are Some Other Ways To Cook Swordfish? The grill is excellent for swordfish steaks or kebabs. For this particular recipe everything can be made outside. Just bring all the chopped ingredients to the grill with a heavy duty pan and make the sauce in the same manner over medium heat. When that’s finished brush the swordfish steaks with some olive oil, salt and pepper and grill them over medium heat. The cooking time should be roughly 6 minutes total for 1″ thick steaks. Another easy swordfish recipe is to simply broil in the oven with oil, salt and pepper. I like to put the swordfish steaks in a cast iron pan and broil for 2-3 minutes per side. When they are finished, a super simple caper, lemon butter sauce can be whipped up in the pan in 1 minute with no heat. I’m getting hungry thinking of that dish – that will be another recipe I write up on here at some point! Pan Seared Swordfish Recipe Difficulty Level? I am going with a 2 out of 5 with 1 being easy and 5 being very difficult. This is an easy and fast swordfish recipe! Just watch the pan as the swordfish is searing and try not to overcook it. Stay at medium heat and 6 minutes max for 1″ steaks and everything should be fine. 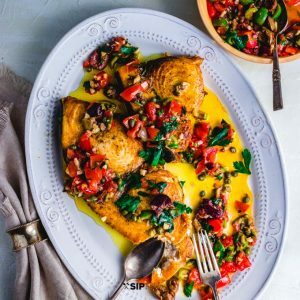 This is an excellent Mediterranean fish recipe that we really hope you enjoy! Mince the garlic. Rough chop the olives. Chop the parsley. Halve the tomatoes and scoop out the seeds. Chop the tomatoes. Saute the garlic on medium to medium low heat in 1/4 cup of extra virgin olive oil for 1-2 minutes. Add the olives and saute for 1 minute. Add the tomatoes and saute for 1 minute more. Turn off the heat and add the parsley, capers, and optional crushed red pepper. Place the olive and caper sauce in a bowl. Wipe down the pan and heat the regular olive oil on medium. Pat the swordfish steaks dry with a paper towel and season with the salt and pepper. Place the steaks in the hot pan and cook for 3 minutes per side. Remove the steaks and plate. Spoon the olive and caper sauce all over the swordfish. Serve the remaining sauce on the side for anyone who would like extra. Enjoy! Tuna and Mako Shark are great substitutes for this recipe. The crushed red pepper flakes are totally optional. 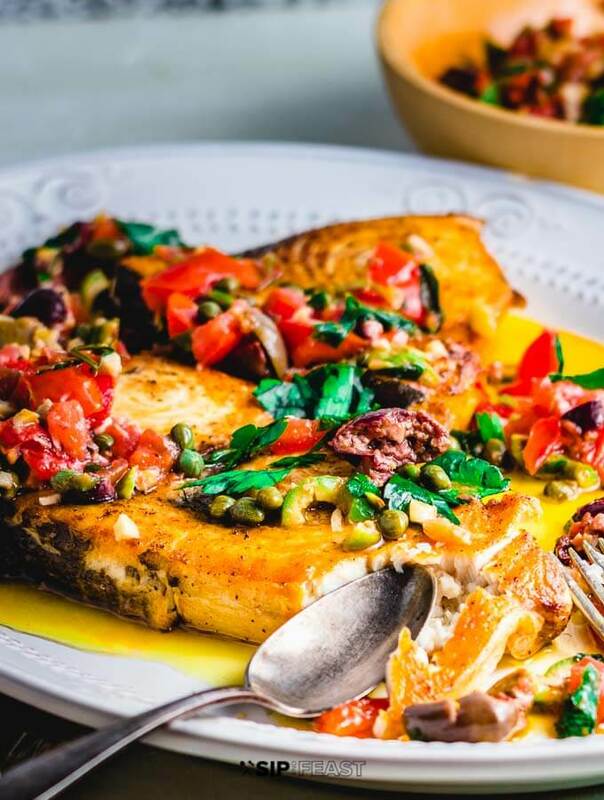 If you liked this pan seared swordfish with olives and capers recipe we would really appreciate it if you would share it on Instagram or Facebook using #sipandfeast.